Kenya’s World 800m champion and World record holder David Rudisha clocked a fabulous 1:41.33 today (10), missing his own World record by 0.32 sec on his favourite track to highlight a memorable 41st edition of the Rieti IAAF World Challenge meeting. 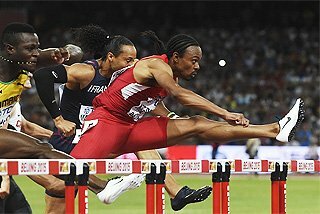 The 2010 IAAF World Athlete of the Year set the third fastest time of his career after his clockings of 1:41.01 in Rieti and 1:41.09 in Berlin last year. Rudisha has now run three of the five fastest times in history (the other two were set by former World record holder Wilson Kipketer of Denmark with 1:41.11 and 1:41.24). In Rudisha’s wake, Poland’s World Championships finalist and European Indoor champion Adam Kszczot set the fastest time of his career clocking 1:43.30. More fast times followed, with this year’s World Youth silver medallist and World Championships finalist Mohammed Aman from Ethiopia smashing the World Youth best and the national record with a hugely impressive 1:43.37 in the process beating former World champion Alfred Kirwa Yego who ran his seasonal best finishing fourth in 1:44.07. In total, seven men dipped under 1:45 living up to Rieti’s reputation as the temple of middle distance running. Poland’s world finalist Marcin Lewandowski (1:44.53 seasonal best), Jackson Kivuva (1:44.53) and Australia’s Jeffrey Riseley (1:44.64) rounded out the top-seven of another superb 800 metres race. 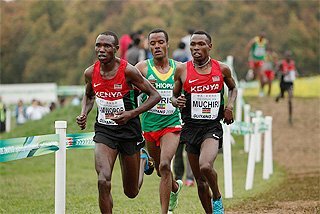 Rudisha’s friend and training partner Sammy Tangui paced him at 200 metres in 24:02 and 400 metres in a super fast 48:30. Then Dutchman Bram Som, 2006 European champion, took the charge to pace Rudisha until the 500 metres. Then it was Rudisha against the clock. 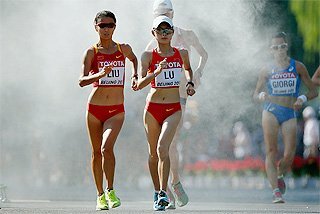 The Daegu World champion went through 600 metres in 1:14.28. Probably the split between 400 and 600 metres was too fast and this took its toll and despite the enthusiastic crowd pushing the Kenyan in the final 200 metres, it was not enough for the World record. “The pace was ok. I felt in record shape but it was too fast in the 200 metres split between 400 and 600 metres. The conditions were perfect. Daegu was hard but I did not feel tired because I had time to recover. 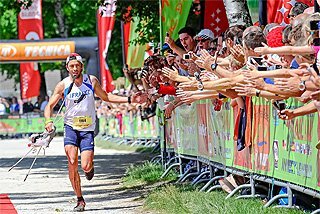 I will run in Brussels (16 September) and at the Notturna di Milano (18 September). Whether I attack the World record, it depends on how my body feels,” said Rudisha. Asbel Kiprop, another of the newly crowned World champions in Daegu, set the world seasonal best at 1500m with 3:30.46 which improved Silas Kiplagat’s previous best time of 3:30.47 set in Monte-Carlo on 22 July. Pacemaker Andrew Rotich paced Kiprop to a very fast 400 metres in 54:56 and 1:49.61 at the 800 metres mark. Then Kiprop ran alone against the clock pushing hard in the remaining 700 metres. He went through at 1200 metres in 2:46.61. Kiprop, only seventh in Zurich on Thursday, romped home in 3:30.46, setting the fastest time of his career. Nick Willis from New Zealand, Olympic silver medallist in Bejing, finished a distant second in 3:35.52. “I feel excited. 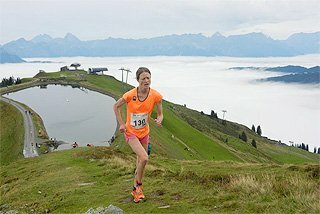 The conditions were excellent and the pace was good. It’s important to finish the season as World champion and world leader. I know that I can run faster. 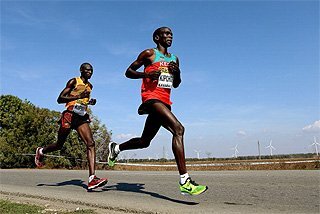 My last race will be the 800 metres in Brussels,” said Kiprop. The men’s 3000 metres was another super-fast race. The race was paced by Kenyan Joseph Kiplimo who went through 2km in 5:01.65 followed by Bernard Lagat, Vincent Chepkok, Thomas Longosiwa and last year’s Rieti winner Tariku Bekele. The race came down to the wire in the final lap with Lagat, Chepkok, Longosiwa and Bekele fighting it out until the final straight. Bernard Lagat, who set the US American record of 7:29.00 last year in Rieti, clocked a winning 7.32.13. The victory capped a season in which Lagat has won the World silver in the 5000 metres and set the 5000 metres US record in Monte-Carlo. Chepkok finished second in 7:32.38, ahead of Longosiwa who clocked a seasonal best with 7:32.71, and Bekele, fourth in 7:34.71. The women’s 1500 metres went to Moroccan Mariem Selsouli in 4:01.04. Ekaterina Martynova finished runner-up in 4:02.10. 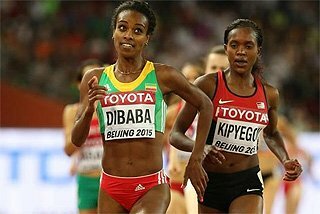 The women’s 1500 metres B race also produced fast times: Hellen Obiri set her PB clocking 4:04.11 beating Ethiopian Genzebe Dibaba (4:05.90). On the track where Asafa Powell set a World 100m record with 9.74sec in 2007, the men’s sprint was expected to be the other highlight of the Rieti meeting especially after five men dipped under 10 seconds last year. Former World champion Justin Gatlin cruised to an easy win in the first of the two 100m heats in 10.12. 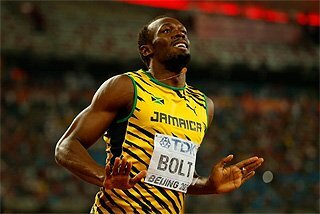 However, Jamaican Nesta Carter, who won last year in 9.78 becoming the fourth fastest sprinter in history, pulled out of the meeting. 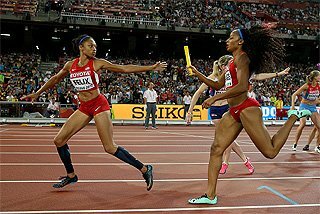 In the second heat, Norwegian Jaysuma Saidi Ndure was disqualified due to a false start, and at the second time of asking USA’s double 100 and 200 metres World silver medallist Walter Dix stormed to a easy 10.04. In the Final, it was more of the same dominance, with Dix cruising to a solid win in 10.02, The fight for second place was very close with Jamaican Lerone Clarke edging out former World gold medallist Justin Gatlin, with both sharing the same time of 10.08. In the longer sprint, World 400 metres silver medallist Lashawn Merritt moved down distance and clocked an impressive 20.13 to win the men’s 200 metres beating Norway’s World Championships fourth placer Jaysuma Saidy Ndure (20.41). Jamaican World University Games gold medallist Shillonie Calvert took the win in the women’s 100 metres in 11.09, with World 100 metres Hurdles champion Sally Pearson, straight from her impressive 12.52 hurdles race in Zurich, producing a fast race to finish second in 11.24, missing the Australian record set by Melinda Gainsford Taylor in 1994 by 0.12 sec. World finalist Ivet Lalova, who trains in Rieti under the guidance of Roberto Bonomi, took third place in 11.28. In the women’s 400m Hurdles, which opened the meeting, Jamaican Kaliese Spencer took her second consecutive win in Rieti clocking 53.60 two days after winning in Zurich which earned her second Diamond Race title in a row. Jamaica took another win in the women’s flat 400m through Olympic silver medallist and Daegu sixth placer Shericka Williams who edged out of European champion Tatyana Firova in the final straight with 50.81.to 50.97. Despite post-Daegu celebrations and fatigue following her World High Jump bronze medal, Italy’s Antonietta Di Martino had a clean sheet clearing 1.82, 1.86, 1.90 and 1.93 at the first time of asking before needing three attempts to clear 1.96 for the victory. “I felt tired after Daegu. I have only three competitions in my legs because of the injury and this affected my competition”, said Di Martino, who will probably compete in Rovereto, Brussels and Milan next week. 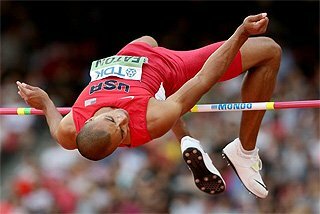 In the men’s Pole Vault, Cuba’s World silver medallist and national record holder Lazaro Borges cleared all heights at the first attempt until 5.71m before vaulting 5.81 at his third attempt to win. Olga Zaytseva, who leapt to 7.01m this year winning the Russian Championships, jumped 6.83 and 6.84 in the first two attempts to take the win in the women’s Long Jump. World University Games finalist Emanuele Abate from Italy set a new 110 metres PB to take a surprising win in 13.54 sec, edging out USA’s Joel Brown (13.57) and Jeff Porter (13.57). The IAAF Hammer Throw Challenge was held over two days. On Friday afternoon (9) a qualifying round was held to determine the four best women and men for Saturday’s final. World silver medallist Kristian Pars from Hungary produced the best throw with 81.12m. The other qualifiers were Dilshod Nazarov from Tajikistan (77.86), Primoz Kozmus from Slovenia (77.68) and European silver medallist Nicola Vizzoni from Italy (77.59). In the women’s department World champion Tatyana Lysenko from Russia threw 72.62, the best in the qualifying round ahead of Cuba’s former World champion Yipsi Moreno (71.86), Kathrin Klaas (70.07) and Zalina Marghieva from Moldavia (69.97). 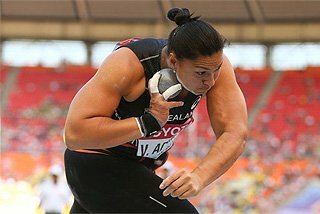 In today’s Hammer Throw Final, Lysenko produced a super series of throws highlighted by a new meeting record of 75.58m which improved her own stadium record (74.80) set last year. 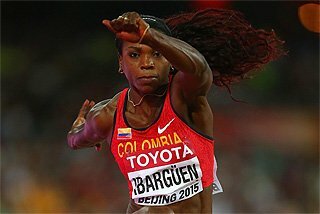 Yipsi Moreno, twice World champion and fourth in Daegu, finished second coming close to 73 metres with 72.94 beating German Kathrin Klaas by nine centimetres. In the men’s event, Kristian Pars threw the implement to 78.77 to clinch the win. A second best throw of 78.61 would have also been enough to take the win, as Nazarov could only produce a best throw to 77.51. Nicola Vizzoni finished third with 77.19 beating former World champion Primoz Kozmus (76.58). World Hammer Throw champion Koji Murofushi, meeting record holder with 82.62, did not compete. He had returned to Japan following his victory in Daegu, but made the long trip to the Italian town to attend the meeting as a special guest.